In freely behaving rodents, the hippocampus displays prominent deflections in the local field potential during immobility and sleep. These are called sharp waves, last for about 40 to 60 ms and are jagged with a fast oscillation, or ripple, of about 200 Hz. Sharp waves have been shown in rats to co-occur with multi-unit replay and preplay patterns following and preceding a learned spatial experience [1–3]. Patterns are compressed in order to fit within the tight temporal frame offered by the sharp-wave ripple complexes. On a cellular level, it is known that both interneurons and pyramidal populations are significantly phase-locked to the ripple phenomenon. Our focus is to understand the coordinated cellular activity that triggers, shapes and terminates the sharp-wave ripple complexes. To this end, we resort to in vitro simultaneous field potential and single-cell voltage clamp recordings on submerged mouse hippocampal slices, where the phenomenon appears with characteristics known from the in vivo situation . Recent pharmacological investigations with this setup (Maier 2009, in preparation) suggest that the intracellular high frequency oscillations are mainly supported by excitatory currents (see also ). To test this hypothesis, we have compared the patterns of synaptic input to pyramidal cells during sharp waves under two voltage clamp conditions. The first, at a holding potential of around -72 mV is representative of a bias towards excitatory input only, since it is close to the reversal potential for inhibition and the other, around -50 mV is dominated by outward, inhibitory currents while still containing some excitatory activity. Figure 1 shows the cumulative distribution functions of relative ripple powers for excitatory (blue) and inhibitory bias (green). Excitatory synaptic inputs show consistently higher relative power in the ripple band when compared with a mix of excitation and inhibition. To investigate the timing of individual post synaptic currents (PSCs) we estimated putative PSC time via a deconvolution approach. We find that ripple-locked excitation arrives predominantly at the beginning of the sharp wave, whereas inhibition arrives late in the sharp wave. Inhibitory currents are less coupled to the ripples than excitatory ones. 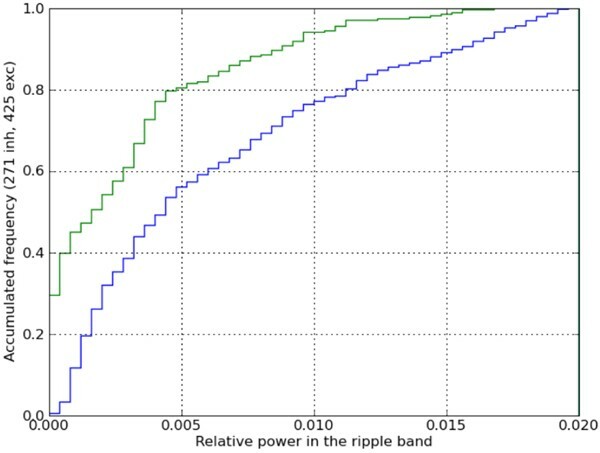 Cumulative distribution function of ripple powers in the ripple band (120–300 Hz) relative to total power. Blue: excitatory bias condition (-72 mV), n = 425. Green: inhibitory bias (-52 and -47 mV), n = 271. This work was supported by the Bundensministerium für Bildung und Forschung (BMBF, grant numbers 01GQ0440 and 01GQ0410) and the Deutsche Forschungsgemeinschaft (DFG, grant number LE 2250/2-1).